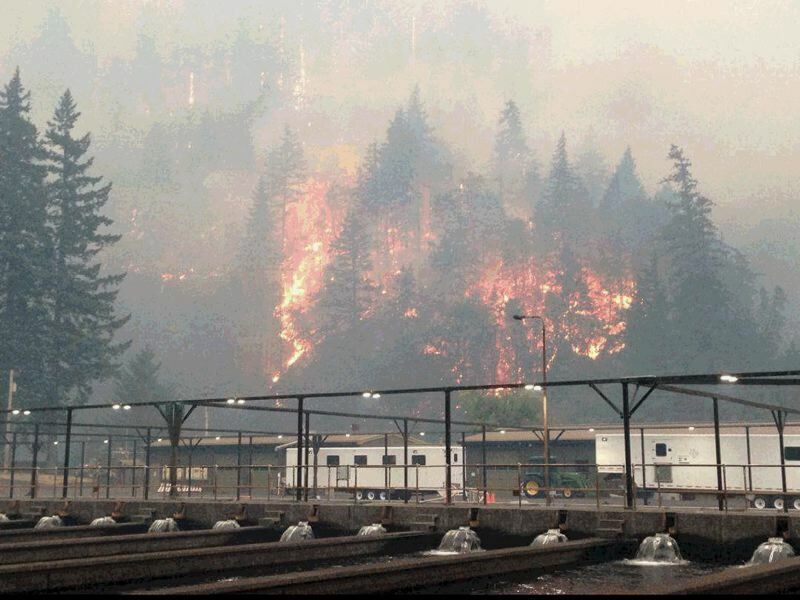 The Eagle Creek Fire is burning within view of fish hatcheries in the vicinity of Cascade Locks - Bonneville, Oxbox and Cascade - leading to evacuations. Three Oregon Department of Fish and Wildlife fish hatcheries near Cascade Locks — Bonneville, Oxbow and Cascade — were evacuated over Labor Day Weekend as the Eagle Creek Fire drew near. All ODFW staff are safe and accounted for and a small number of staff are returning to monitor facilities and fish as they are able. "The safety of our staff and the public is always our first priority," said Bruce Eddy, ODFW East Region administrator. Over the weekend, Cascade Hatchery served as a staging area and place for family members to reunite with some of the 145 hikers trapped by the fire. "We are relieved that the hikers made it out safely and wish them and their families well," Eddy said. Firefighters are using the three hatcheries as staging and firefighting areas, and supplies at the three hatcheries (including water and power) are also helping firefighting efforts. Firefighters also foamed some hatchery buildings to keep them from catching fire, and cut a firebreak and lit a backfire above the Cascade Hatchery to keep the fire from reaching the facility. The Cascade Fish Hatchery is right off Interstate 84 on Eagle Creek. At this time, no structures at the three hatcheries have been damaged by fire, but the situation remains serious. "We really appreciate all the efforts firefighters are making to protect these facilities," Eddy said. ODFW is making some early releases of fish to reduce demands on the water supply and equipment. Four ponds of fall Chinook scheduled for release in October were released early last night and another 600,000 tule fall Chinook scheduled for release next March were released this morning. Both releases were made into the Columbia River. "Water flow to the Bonneville Hatchery was restricted by fire debris in the hatchery intakes, and there was no way to clear the intake," said Eddy. "Pumps not down for maintenance are being used to supply the facility now." "ODFW staff will continue to operate the facilities as best we can under these difficult conditions," he said. Currently the facilities are rearing 6 million fish (mainly coho and chinook salmon). Bonneville Hatchery is also home to the Sturgeon Viewing Interpretive Center where Herman the Sturgeon is currently doing fine.